Work-Life Balance a perk of Edible Arrangements franchise ownership! In 2004, Janine and her husband Jerry opened their first Edible Arrangements® store on Long Island, signing a 10-year franchise agreement. Things have gone so well that they have just signed on for another 10 years! Janine explained why she and Jerry decided to pursue their small business dreams with an Edible Arrangements franchise. Janine also noted that one of the biggest benefits of being a small business owner is that it has provided her flexibility over when she works. The result is a healthy work-life balance and a better quality of life. Despite always being very busy during the holidays, Janine says that the tradeoff of having quality time to spend with her daughter and family on a daily basis is wonderful! “It is a good way to make a living and I would do it over again,” she noted. And she has done it again! In addition to signing on for another 10 years, Janine and Jerry also opened a second Edible Arrangements store in 2007, and have plans to open a third store within a year! “I am very proud of what we have accomplished with our Edible Arrangements stores,” Janine said with a smile. 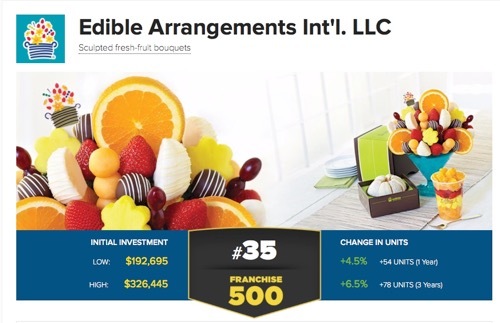 Edible Arrangements is the Middle Market Center’s Company of the Month!